As Noah Grows...speech, eating and therapies. Noah is 3.5 and has only had two surgeries thus far. We know more surgeries are to come but for now and until about age 7 there is nothing planned. Unless we go to cleft team this year and they determine something would need to be touched up. But I'm thinking Noah will still have the same result as last year, no planned surgeries. As Noah has grown we have certainly had many things to think about. Eating is certainly the first concern with cleft babies. As a parent we want to know if our child will be ok, if they will be "normal" or "typical" especially when they are born with a difference from other babies. I know I wondered the same thing! 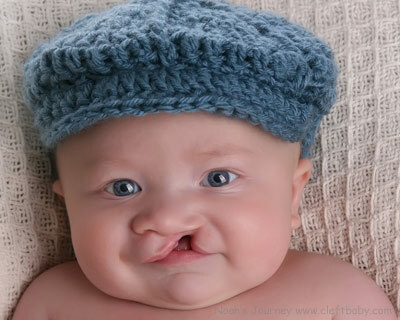 When Noah was of age to begin eating solids off a spoon his cleft team certainly didn't stop us. They gave us the green light without a second thought. I know I worried because Noah didn't have an intact palate! He still had a cleft that wasn't repaired, how on earth was my baby going to eat baby food without it coming out his nose?! Well, Noah gave it a shot. Yes, food came out his nose. Drinks came out his nose. That was the new reality and it was strange at first. But even with those challenges, he kept trying. Noah tried hard. Some days he had great success, other days it wasn't so easy. Eventually we realized that something wasn't quite right and that we needed to speak to his surgeon about our concerns. Noah ended up needing to have some help from an occupational therapist. It was discovered that Noah's tongue was only moving in one direction, in and out. No side to side, no up and down...just in and out. Without the necessary movement, Noah was gagging on his food. Finally we had an explanation. Noah needed some work with his Oral Motor Skills. When Noah was 13 months, he started occupational therapy at Children's Hospital of Michigan. His therapist was fabulous, she worked well with Noah in all sorts of ways. She used different foods, different textures and different ways so his tongue could gain the range of motion it needed for Noah to be successful eating. It took a number of months plus a lot of work and much patience. But about 7 months later Noah graduated from OT and was able to move forward with his new found oral motor skills to conquer mealtime. Since Noah is a boy and most boys seem to focus on climbing, running and jumping I didn't expect him to be an early talker. He also has two older sisters, so honestly I figured he was definitely going to let them talk for him. They are girls and they have lots of words to use on a daily basis! But once Noah was one and his words were few, I did take notice. However I didn't panic, that whole "he is a boy and he has two older sisters" reminded me not to panic...yet. Once he was nearing 18 months, his words were few. He babbled like crazy and wasn't short on ways to be expressive. But it was how he was expressing himself that was the issue. Very few words, but some gestures to at least help us out to decode what he wanted. We gave him more time, but when he was nearing age 2 we decided to start speech therapy. We didn't see a huge amount of progress that first 8 months. We then utilized our local early childhood programs to get him more speech therapy with a different therapist, which worked wonders for him! He started using more words to get his point across. Which was certainly a great thing to see. He finally said "mommy" when he was two. I cried, then cried some more. I had been waiting so long to here that precious word. It took time, but it was definitely worth the wait! 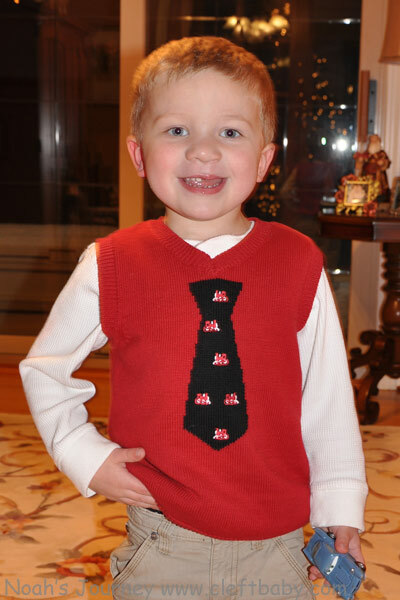 Noah now attends a preschool that is language intensive and still receives individual speech therapy. His progress has been huge. He is still catching up for his language ability to meet his age, but marked progress is there!! While decorating the tree for Christmas Noah walked by and simply remarked "oh, it beautiful!". I almost fell over! For him to use a word that big and just make a comment as he walked into the room was surprising! Most children with a cleft palate will need some level of speech therapy. Noah has been in speech therapy for 2 years and we don't intend to take a break from that any time soon. Even though he receives speech therapy at school, I'm already planning for his summer speech therapy and it's only January. Once he is out of school, we want him to keep up private speech therapy through the summer until school resumes. Noah is very fortunate because his speech is very clear. With a cleft palate repair there is always the risk of having a nasaI sound when speaking. Noah's palate repair has been so successful that the words he does say are quite clear. 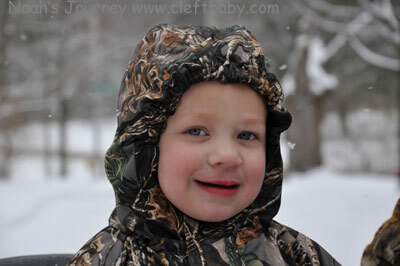 We realize that as Noah grows his palate will change. We don't know what the future will bring with his growth, but we are certainly thankful that at this point Noah has clear speech! One thing to remember is you are your child's advocate! Sometimes it isn't so easy to get into local, state funded programs for a variety of reasons. Keep trying, keep calling and keep working to get your child what they need! Don't give up!! I know I ran into road blocks myself and it was often really a daunting task to keep up with. I didn't know where to turn or what to do. But I just kept going. Do that! It can get exhausting, but remember what your doing is giving your child the best future possible! Disclaimer: The information on this website is reflecting a personal experience and is not intended or implied to be a substitute for professional medical advice, diagnosis or treatment.